Check out THESE general guidelines for using the tool to avoid issues, especially with additional toon setup. V1.0.5.0 Added option to copy back your previous keybinds/macros from the backup made by the Clean Install option. It is highly recommended not to delete or move your WTF folder if you want to use this feature. It's Best to just make a copy of the WTF folder you want to back it up yourself. Step 1 : Make sure you have the latest version of Towelliee's Tank UI. Step 3 : Run Towelliee.exe (the Toon setup installer) from your wow folder, and select the appropriate install type, for initial install it is recommended to do a Clean Install (some installer info below). Step 4 : Once you're in game just click that HAMMERS UP!!! button. Step 5 : Quit game completely for Additional Toon installation. * Fixed bug with Additional Toon setup, only need to click once now. * Added option to copy back previous keybinds and macros from the clean install Backup. * Clicking on the "Towelliee Gaming" image opens Towelliee's twitch channel in default browser. * more fine tuning to the extras installation. * fix for selecting only keybinds extras. * makes sure the previous method of keybinds and macros is not installed. * Keybinds and Macros are now optional Extras. Once I installed the UI correctly and updated all the addons via curse + re-installing bartender4 (for some reason it uninstalls it during update) and also re-installed the UI I'm still ending up with green templates over ex. consecration WA2 and shield of the righteous. The chat is flooded with messages such as "Your AddOns are experiencing a large number of errors and may be slowing down the game." and neither buggrabber nor bugsack help me figuring out what the cause of it is (might be because both of these are also outdated and causing their own errors). Is there an updated version of the UI or a known fix that manages all of the current addons that towel is using or is this the only option out there? Hi, I'm playing on a mac and your installation too does not work for mac. Is it possible to get it for mac??? Hi i get errors when im installing this. Sorry that some of the test is in Danish, but that my system. Also i did try and make the folders it was looking for, but nothing works. sorry for the late responce, this error means the installer can't find the UI files. 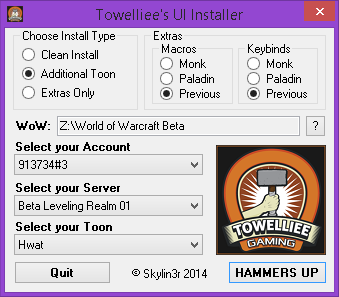 This page is just for the installer, you also need to download the actual UI and unzip both into your WoW folder. hvordan du starter JIT-fejlfinding i stedet for denne dialogboks. System.IO.DirectoryNotFoundException: Could not find directory 'C:\Games\World of Warcraft\WTF\LUI-Towelliee\Setup\ACCOUNTNAMEHERE_NOTEMAIL'. at blive afviklet af denne dialogboks. Last edited by soerenhelmer : 09-05-16 at 03:39 PM. Not sure if this is a bug or maybe it is working as intended. So I apologize if I did it wrong. When doing a Clean Install or Additional Character and selecting the Paladin Keybinds & Paladin Macros, they do not work. I have to go back and select the Extras Only and then the Keybinds & Macros, once I do that it works. I'm aware of this, this is caused by the synchronize cvars changes blizzard made. so the 1st run doesn't work cause the md5 hash is old. The Fix is UI based and not installer, WoD Beta version was updated to turn off synchronization. Ah, okay. I apologize for having posting on both the UI & the Launcher. But thank you very much for answering! Hey, I cant seem to find a solution on how to get the hammer's up button again, when I use it on one character its completely screwed up on the next cause of the big LUI thing in the way. did you run the "additional toon" install on the next? Why woud you need an exe file for UI setup?? With this you can easy load addon profils with one klick. Just share your saved variables. No need to rename for every char. You may look how its done with my interface. unfortunately a lot of users have difficulty doing this stuff manually. just because it seems easy for you to do it like that, doesn't mean it's as easy for others. How do I save modifications that I have made to the UI so that I can copy them over to my alts easily. depends on what you modified, most save it in the addon's lui file in the savedvariables folder. some save it in the savedvariables folder under the toons folder. If I install using a clean install and customize various elements how do I use this tool to setup additional toons with those modifications? Hey Goth, this addon is meant to be used alongside Towelliee's addon compilation. It sets up the Cvars, as well as the entire UI itself. It is used to streamline the setup, so you don't have to really rename numerous folders and go through the normal process. Think of it as a massive INSTALL wizard on a program.